The new Northern Ireland secretary has said that combining his job with that of Welsh secretary will not mean any diminished effort in his role. 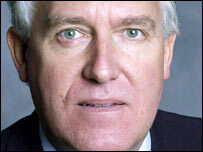 Outgoing Leader of the Commons Peter Hain is replacing Paul Murphy in a prime ministerial cabinet reshuffle. The DUP has said the dual portfolio means the job of Northern Ireland Secretary is being downgraded. But Mr Hain said he would be talking to key political players at the weekend and be in Northern Ireland on Monday. "This is a very, very important time," he said. "Obviously the election results have sent their own messages. "I intend to take account of those and to make sure that we bring everybody together. "I believe that with efforts and good will, we can crack this problem and make sure that we get progress on events and get everybody working together." Speaking in London on Saturday, Mr Hain said there was a "tremendous period of peace" since the Good Friday Agreement was signed. "We must get that back and established," he said. Mr Hain's appointment followed a day of big changes in Northern Ireland's political landscape with the DUP and Sinn Fein making big electoral gains. Sinn Fein President Gerry Adams, whose party now have five parliamentary seats, said it was important that negotiations got under way as soon as possible. "There is a huge responsibility on us but there is also a huge responsibility on the DUP and on the two governments," he said. "The opportunity for progress must now be seized. We want to see a return to the talks as quickly as possible to get the Good Friday Agreement implemented and the political institutions restored." Paul Murphy leaves government to become chairman of the Intelligence and Security Committee.